I set this table and photographed it for you on Memorial Day. Yes, I thought of using the colors of the American flag. I do love those colors and everything they represent. For me, however, Memorial Day brings back a flood of memories that are only partly connected to the courageous men and women who gave their lives in service of home and country. Growing up in the rural South, it seemed to me that we celebrated Memorial MONTH! Decoration days (as we called them then) took place at different cemeteries throughout May. My mother always took my younger brother and me along as she placed flowers on family members’ graves in at least three (sometimes four) cemeteries. The “Third Sunday” decoration day was the one she loved the most. Her aunts, uncles, and cousins would drive in from far and wide for a family reunion. There would be a program at the little country church she’d attended as a child. Afterward, tables would be set up in her aunt and uncle’s front yard. It was a challenge for the ladies to plan what to wear. The month of May can be tricky in Tennessee. Some Third Sundays would be hot and muggy. Often there would be a slight chill in the air. I only remember it raining once, but that was always a possibility. They all managed to look “mighty stylish,” as my grandmother used to say. And the food – so much of it, all delicious! It was like a recipe contest, a friendly competition with all the participants sharing the very best their kitchens had to offer. I’d like to dedicate this post to all those caring mothers, grandmothers, aunts, and cousins. Many of them had lived through the Great Depression. Most were stay-at-home wives and mothers. Somehow they all knew how to feed their families delicious, nutritious meals on a budget (not necessarily low in calories!). They managed to clothe their families in style too -- without spending a great deal of money. They all loved to set pretty tables. The dishes might have been acquired with trading stamps, from saving boxtops, as premiums inside boxes of detergent, or purchased inexpensively as the “dish of the week” from the supermarket. Whatever the source, they used them with pride. Their centerpieces were always garden flowers -- although we said “from the yard." Vegetables came “from the garden!” Yes, we knew flowers could be ordered from a florist (wreaths for funerals and corsages for special occasions), but the flowers in their yards were grown from seeds or from sharing with friends, neighbors, and relatives. The dishes I’m using today were hand-painted by women (and perhaps a few men) who lived similar lives. They’re mid-Twentieth Century “Blue Ridge” china made by Southern Potteries of Erwin, Tennessee. You can tell the underglaze decoration wasn’t done by machines, because there's often considerable variation from one piece to the next. I’ve read that it was mostly done freehand. Certainly some of the artists had heavier/lighter touches than others. At one point Southern Potteries was the largest hand-painted pottery business in the United States, but revenues declined in the 1950s due to the rise of inexpensive imports and the development of plastic dishes that didn't chip or break. Remember Melmac? I can’t say I ever liked the stuff, but it was wildly popular ... for a while. Blue Ridge dishes are considered collectible, but most pieces are still quite affordable. As with any type of vintage china, the best values are often found when buying full (or almost full) sets. As I share these images of a cheerful, colorful mid-century-style table setting, I’m thinking of the hymns sung in that little country church, of my grandfather and his brother on the front porch playing bluegrass tunes on the fiddle and banjo, of the smell of the dust from the road leading to the old cemetery (mingled with honeysuckles in bloom). Of the even sweeter powdery smell of my mother’s handkerchief as she wiped a smudge from my face on the way to the church. 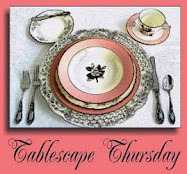 Please join Susan of Between Naps on the Porch for Tablescape Thursday (click HERE to join in the fun). Thank you, Susan, for hosting this event that brings together kindred spirits from around the world. I'm also joining The Style Sisters for Centerpiece Wednesday. Check out the party HERE. 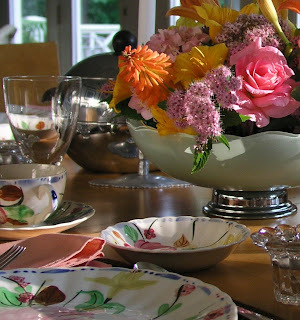 I had to comment on the lovely flower arrangement; the colors are luscious and go beautifully with the dinnerware! I didn't know anything about Memorial day until I read your blog. We have Remembrance Day on or around November 11th in the UK. I love the china, lovely and Summery. I think the idea that it is all hand painted is marvellous. Thank you for sharing your memories of a special day no matter what time of year we remember the people who gave their lives for their countries and the families left behind to mourn them. Beautiful table, Bill! Thanks for sharing your memories of Memorial Day. One of my memories of Memorial Day was that it was the day of the first or second horse show of the year. Anyway enough about me, more about your table. The china is really pretty, so springy, so colorful, and I like the stemware you've chosen as well. Once again you have a fabulous floral centerpiece. You do just great on putting together a pretty bouquet! What great memories! I love the beautiful colors of the dishes and your flower arrangement. Wonderful post, Bill. I love the dishes and your centerpiece. Yes, TN weather is so unpredictable! Your tribute to the women who kept the home fires burning reminds me of those who are doing the same for the servicemen who are in Afghanistan. Being from Clarksville, I was always aware of troops leaving or arriving home at Ft Campbell. I met my hubby during my college days while he was assigned to the Post. Thanks for reminding me of how blessed I am to be one of the military wives, even if it was only for his last 3 months of duty. I enjoyed reading about your wonderful memories of Decoration days of years gone by. I could see it all in my mind's eye. Your table and centerpiece are just beautiful! I posted of much simpler family observances of what was Decoration Day on my blog also- of gathering flowers with my grandmother. Thanks again for sharing this beautiful tablescape. I want to say I have seen that pattern before or one very similar, but don't remember where. Bill_ I love this. I always think of the women who were left at home and in a time when there was no quick way to communicate. I think some of the world's great love letters were written during this time--a lost art, I fear! I also remember being taken to cemetaries by my grandmother. The women at home indeed made a contribution. I adore these colors and the wall of art. I love this table!!! My memories are very similar to yours. We would go to Sussex, NJ and visit the cemetery with my grandmother. We would always take lilacs to put on the graves. They would be swept and weeds would be pulled and stories would be told. There might be a tear or two. Then we would go to one or the other of the great aunts for a picnic. Very fond memories. Now about the floor.....and the chair.... I just ran out of time and I did not do the kitchen cabinets or another wall unit in the living room. Another time. Dear Bill. I hope my English is good enough to express my thoughts correctly. Although I am very surprised by your table I really adore it. After reading those very touching memories to your childhood I really can see in my imagination your aunts and uncles and relatives, sitting around the table, dining, chattering and laughing. This china is very charming, good old handcraft, made with pride. And your flowers look like a tropical fruit coctail. As usual, you arranged a perfect table, matching in style and colors. It's a loving tribute to your family. And it is so odd with that memories to the powdery smell of your mother’s handkerchief. A long time ago I sat in a bus and smelled this special scent. I remembered this was a very personal fragrance from my childhood, very familar, and so I turned my head to look who sit behind me. It was a elder women. It took me a long while to discover, that lady must have used the same powder like my mother did in childhood. Isn't that funny, how one can remember fragrance so well. I loved the story behind this tablescape. You made me remember sitting down to the tables when I was a young girl, with dishes my mom collected from blue chip stamps or when she was able to save a few extra dollars and purchase the plate of the week at the grocery store. Bill - as I read this, I felt like I was right there with you at your family reunion -- this all reminds me of the wonderful times we had running around with cousins and friends at my father's family farm -- he was one of 8 kids and 2 orphaned cousins - so there was always a "whole passel" of us! Thanks for sharing your wonderful memories with us today. What a wonderfully vivid description of bygone times! It was so thoughtful of you to think of the women left behind during war times, who worked hard to keep the family together & the home fires burning brightly for their loved ones. Its a beautiful table in such soft shades & the clean lines of the table & chairs mimic the sleek shape of the metal container so well. Your flower arrangement is nothing short of spectacular! I cut a few yellow roses today but my spring flowers are done for this year. I think I need to plant some PINK roses like the ones you used...simply gorgeous! Bill, I have a bit of this pottery and just love it. As always, your table leaves me dreaming and smiling. Hope you had a marvelous weekend! Love, love, love those dishes! And yes, when I was growing up it was always Decoration Day at the cemetery and then a big meal after church services. Families came from many miles to decorate the graves of their relatives. So much tradition that seems lost nowadays. Simple is best sometimes. My mother's birthday is the 29th of May and she said she spent most of her birthdays in Idaho going to the graves of relatives placing flowers. Thank you for the reminder of those who worked hard to make pleasant reunions for family and friends. A very Southern table -- suitable for a Memorial Day dinner before the relatives head out to the cemeteries. We did this, too, when I was a child -- and since so many were buried in so many different cemeteries, we had to go to ALL of them! I have some Southern Pottery China that I bought last summer in of all places Minneapolis. I adore their patterns and I love how beautifully you have set this table! I need to pull mine out. And your centerpiece is really fantastic, you have that touch! A very colorful and beautiful dedication Bill. The south seems to be filled with so many unique celebratory traditions. Decoration day sounds like a wonderful tribute to the memory of heroes and loved ones. Thank you for moving post and images. You captured Decoration May in the south so beautifully. Although I am a northerner, I have a heart of a southerner. Your vivid word picture is such a delight to me, and I can see all of it so clearly in my mind. Your beautiful tribure to southern mothers shows how industious they were (and are). It makes me think of the Proverb 31 women. The beauty of the dishes lies in the folksy painting and the array of color on each plate! What a glorious combination. Your centerpiece is a work of art. The fabulous silver petestaled bowl makes the perfect "vase" for these magnificent blooms. 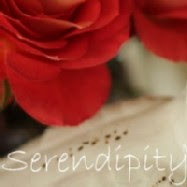 I am hosting my very first giveaway, please stop over and join in. Love the Blue Ridge! Great memories. Be sure to come and join my new meme "Summer Sundays". It's all about what summer means to YOU. i have a feeling it will have something to do with plates! Love this table scape! with all the pretty colors and different textures. Such a great post too! Lovely memories you've shared with us, Bill. Thank you! I always enjoy reading, and of course looking at, your posts. Love your Blue Ridge dishes. The floral arrangement is stunning! I love how your table sits right by the doors like that...almost like you are outdoors but still cozy! I loved hearing about your family memories of Memorial Day. Such a lovely, colorful tablescape, and as usual, beautiful photography. The dishes and floral centerpiece are amazing! Everything looks even more fantastic by candlelight at night. I can't get enough of the flowers!! They are so gorgeous...really breathtaking! Please link up with Centerpiece Wednesdays. I really like the dishes too. They make me feel happy when I look at them. Such a nice tablescape! What a beautiful tablescape! Fabulous dishes and floral centerpiece. Oh Bill this is breathtaking!! I have seen some of this dinnerware in the past. We always had "The Decoration" as it was called here in WNC, and the picture you have described is exactly as I remember it. As I have gotten older, I have grown to love all the depression glass, dinnerware, etc., that my grandmothers and great aunts collected...much of from stamps, etc. What a gorgeous ad reflective post!!! What a lovely table! That centerpiece is gorgeous! Bill, you never disappoint with your lovely tables and even lovelier flowers. Thank you for sharing your memories. I felt like I was a part of your Declaration Day celebrations. And they were so much more than rememberances. You have provided a living, breathing adventure into a precious time. Thank you so much for sharing. Bill, I love the simplicity of this tablesetting. It truly is reminiscent of days gone by. I love the china! Wherever did you find it? Was it another one of your estate sale finds? You make me want to move to Tennessee,because we just don't seem to have estate sales like that here in Eastern NC. I always look forward to your tablescapes each week. Thanks for sharing with us! Bill, I used some "premium" dishes with lilacs in a post I would love to see if you know anything about. They apparently came with sacks of flour to the store my grandfather owned. If you get a chance to stop by, this is the post: http://anita-faraboverubies.blogspot.com/2010/04/accidental-lilac-table.html. Thanks! What a colorful, simple table...the flowers are outstanding and go so nicely with the china you have chosen. My grandmother and great-grandmother had lots of "premium" dishes and dishes they collected from "dish night" at the movies, too. Simply beautiful Bill, but I wouldn't expect anything less from you. Great centerpiece too. Your home always looks so gorgeous and welcoming (and perfectly clean!!) and this setting is so romantic. I love the plates and it is so nice that you have dedicated this post to all the brave and wonderful women and men. I have also been thinking of you often. I wish sometimes you were closer as I am always seeing things on my trips out that I know you would love and want, plus we could do some tablesettings together. Not to mention have a dinner party!! drink some wine and talk about all the wonders of the world. It's getting quite chilly here in Australia now and my garden is bare, the autumn leaves are nearly gone and it's bleak!!. There will be no more entertaining outside till Spring arrives. Hi Bill, Your centerpiece is very beautiful and looks wonderful paired with your dishes. What a lovely tribute to stay at home moms. I remember my mom collecting dishes with trading stamps, thank you for this memory of simpler times! I've been waiting to see these dishes! I remember there was a quick mention of the Blue Ridge set you purchased, so YAY you used them for your post! I love love love them and love your beautiful story of your Mom and life as a child. Your dishes remind me of my grandmother who had a set of dishes that were something like your Blue Ridge dishes, but no stamp on the back and she had two sets of Melmac! Ha ha! How fun to spot your ice bucket! 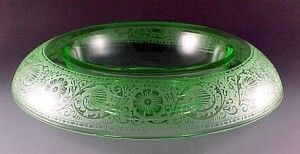 I have the same one from my Mom and Dad's house and use it when we have big family meals. It is a great little bucket! Everything looks so pretty, Bill. I really do love those dishes. Your table looks much like the ones we had, growing up, minus the candles. Not sure why, by my people didn't use candles on the table back in the 40's and 50's. Wonder why? I had an ice bucket like yours at one time. Wonder where it is now? Garage sale, most likely. Now, I want it back! I think this is going to be one of my favorite posts from you. I am remembering such a time that my grandmothers lived in. As a little girl, in the 70's, visits to my NaNa in the country always showed me another world. My mother often makes a production of visiting the cemetarie that I have never really grasped. I am thinking maybe she was raised with "decoration days". I will have to ask. You have set a beautiful and colorful table for a beautiful story! Love it! Bill-our family does Decoration Day too! It has always been a time of wonderful memories of thsoe who have gone before us. I love your table and story you tell to go with it. Thanks for sharing with us!! Bill, I love this post. Thank you for sharing these sweet memories. I sighed with a smile while reading every word. I love this table setting. Of course, I love all of your table settings. Each week you outdo the week before. What is the pattern? Thank you for always sharing. Your are an inspiration. You do it yet again! Week after week you have the most gorgeous tablescapes. And what I love ab it is that you can truly "see" the person behind that tablescape. You obviously have a great sense of design, but it goes beyond that...you want your guest to feel special but still feel "at home". Your tablescape is regal, but not pretentious. It's classic southern and I love it! I LOVE the fresh flowers, I imagine it smells heavenly. The plates are so pretty, like a beautiful watercolor. Well done, Bill! I love it! What a beautiful table...and I love the dishes. They LOOK like summer, don't they. I loved reading about your memories. What a special time. I so wish the kids of today could re-live those times....but they'd be busy on their i-touch, wouldn't they? How gracious and welcoming! I think I could be very happy in the South. I love your Blue Ridge pottery. You brought a lot of memories back of the way I remember my grandmother's house growing up. I have my great-grandfather's Blue Ridge Pottery. He lived 1901-1991. He and my great-grandmother went down to a boat that came in on the Green River in KY and bought house goods. The dishes I have they bought that way. Your table is so pretty. Thanks for sharing. I am having a $50 CSN gift certificate giveaway on my blog, come by and enter to win. Beautiful! Lovely memories and enjoyed the history. I love your childhood memories and can relate to them so well being from Georgia and a child of the fifties. Oh, that we could bring them back again. The table setting is nice but the story is wonderful. Thanks. I haven't been around much, my mother died on May 13th. Today I'm trying to catch up a little on what I've missed and I'm so glad I decided to read this post. You brought back memories of church suppers and summer nights. My memories aren't exactly like yours, my family was small...but, it does seem like an easier time for all of us. The pottery is beautiful and I love it with the centerpiece. As always, the perfect table. Your did a splendid job of capturing the mood you were after! How talented you are! Are those Jim Gray prints on your wall behind the tablescape? Lovely! Your flowers are incredible! I learned many new things today...beginning with Memorial Month. Even though I was raised in the south, Florida had its own traditions. Thank you for the history lessons...and the feast for the eyes. (Especially the luscious centerpiece!). Bill: Love seeing all the different tablescapes you do...I think this one with your Blue Ridge dinnerware is one of my favorites! P.S. The pattern name for your dishes is " Waltz Time", in case you didn't know. I really like this! The story warms my heart! I grew up in Huntsville, AL and your story is similar to what I also experienced on "Decoration Day!" Delightful! Just got home last night from our stay in Jamestown, TN (Helena) with our dear friends. It was also through them that we learned all about Decoration Day as we went along with friend Becky's parents to the graves of their ancestors. The entire family gathered and we had a meal together with lots of stories. That is history at its best! We learned that Tennessee has always delivered more than its fair share of heroes all through history. Brave men from Tennessee like Sergeant Alvin York. Even early on it was Tennessee Military Hero Andrew Jackson who became our nation's 7th President. Loved this blog and also the photos with the great flowers and table setting made it all come to life! I remember those plates. I love the whole table. It has the 50-60's feel. And hand-wrought aluminum and chrome!! My kind of shine! Hi Bill, I'm so happy you enjoyed my Show and Tell Friday ~ Girls Just Wanna Have Fun post! It really was wonderful designing this table to celebrate "PINK" and all things that remind me of romance! Thank you for visiting and taking the time to leave your sweet comment, you made my day! Bill, the blue in the plates is such a vibrant blue. I just could not take my eyes off them. I think I have been here for the last 20 minutes just looking at your table. It really leaves me almost speechless. Please, join us on "Mia Monday". Every week is a new theme, and it is always about YOU! Monday we are sharing five photos of ourselves. Any five...could be more or less. Come by link up and join the party every Monday at "Mia Monday". We have a lot of the same memories for the month of May....around here, we do the same thing for the Memorial Day....remember loved ones and fallen soldiers. I have always taken my boys to the cemetary on decoration, so they will know the important of remembering our loved ones, and hopefully carry on the tradition after I am gone. We do see a lot of familar faces while visiting the cemetaries. Beautiful tablescape as usual. You need to share with your readers a tour of your garden! What wonderful memories...no wonder you turned out so great! Your Mom sounds like a very special person...very loving. Beautiful tablecape...love that sweet china. Your floral arangement is so pretty and goes with the tablesetting perfectly. Hello Bill~ ~I always enjoy your posts and learn a tidbit of something new each time I stop by. I really enjoy that part of my visits. You are a wealth of information. The china is lovely and your story also brings back memories. I am in awe of your dining/conservatory, all those lovely doors and windows it is the most impressive room! I was checking for door knobs and it looks like many of the windows should open like a door but alas, no knobs. I'm sure there is a story around this room. Will you share? This reminds me of the walls of French Doors I have seen. In my dreams I sit at the table filled with friends and all the doors standing opened to the summer breeze. Conversation and wine flowing freely! You write well, Bill. Beautiful table. I enjoy reading your stories. This was a wonderful post too. Thanks for sharing that with me. Not just the plates, but the memories you have.